This new addition is sired by the calving ease specialist Angus Valley 1867 out of the up and coming donor SAV Emblynette 7545. We expect him to sire calves that come easy with muscle and fleshing ability. His excellent performance is complemented by very good carcass traits as he scanned the highest IMF of any bull in the entire 500 bull SAV offering. PlEASE CLICK ON NAME FOR PEDIGREE AND EPDs. 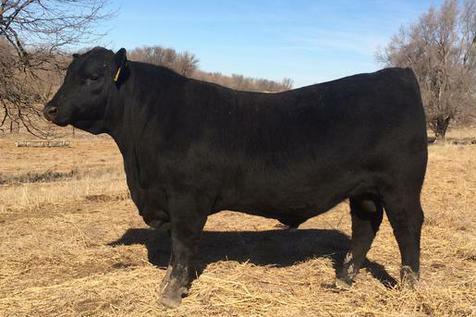 "Balanced" is the word for this Bismark son that has 004 on his maternal side. He is long, deep, and gentle and a calving ease specialist. "554" or "fity cent" as we call him was selected from Gardiners to add marbling, calving ease and "spread" to our herd's gene pool. He is in the top 1% of the Angus breed for these traits. This son of SAV Pioneer was our pick of the 2014 Schaff's sale. He gained our attention with outstanding eye appeal, but his performance, maternal and carcass traits finalized our decision to make him part of the program. He was one of the highest scanning IMF and scrotal circumference bulls of the entire 500 bull offering. Kelly Schaff called him an ideal breeding bull and that year he was pictured in the Genex catalog as the featured Pioneer offspring. He is quickly becoming an anchor of the Dake Ranch program with outstanding offspring.